I went to pick up my Zenith Defy El Primero 21 from Rox in the Glasgow Arcade today( warranty repair) and decided to look around the other watch shops. 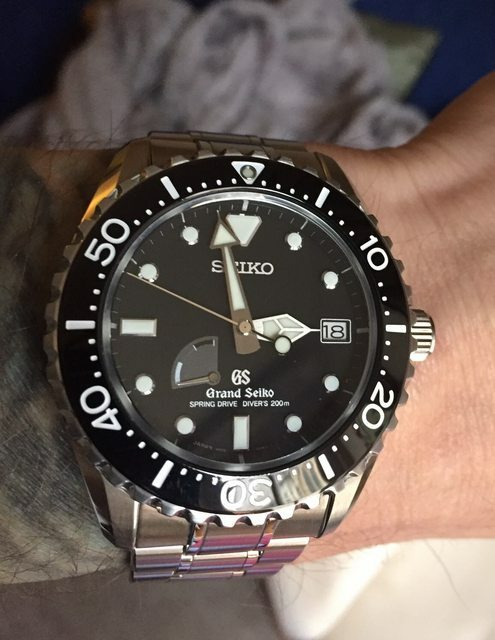 What a mistake as i thought i knew which watch i liked and was going to buy in the coming weeks however i went to James Porter and started chatting about Grand Seiko. The result was me trying on a few different models and all were lovely in their own way. One that stood out was a diver, its the SBGA229, it just was the right size, looked good, spring drive etc etc...After a quick discussion i left without buying but the owner said he was open for pricing discussions with me. Now im thinking i will put off the H Moser to the start of next year to purchase the Grand Seiko. Anyone have this model SBGA229. All prices online seem to be about £5600, can discounts be had in other dealers on Grand Seiko, i would like to be able to give a price point if i use James Porters. Im not near Jura etc so not sure how they are at getting a discount over the phone. Cheers. Last edited by markyboy.1967; 14th April 2019 at 09:25. There is a UK dealer on Chrono24 listing one for less than £4,500 new. Have you considered the titanium Sbga231 version? Cheers, not considered the titanium. Im happy enough withtge stainless, i have a full titanium on tge El Prinero 21. I have the SBGA29 and 31. Excellent watches and can rival Rolex Sub except for the bracelet. Cannot help you with the price except saying that they are more reasonable preowned as they do not hold the price as well. I pretty much echo what Rajen said below. They dont come up often for sale on the used market, but when they do they are worth it! I picked my SBGA029 from SC (several years ago) in pretty much mint condition for around 50% of retail (at the time) A good friend of mine liked it so much me continually pestered me for it/one. A brand new SBGA229 came up on SC last summer at 22% of list which i purchased for him (it had been purchased in the Jura summer sale) both watches remain our prized possessions! Not the best picture, and the sweep second has to be seen! I almost pulled the trigger on the diver too. I preferred the titanium but the steel metal is whiter so it depends what look ur after. Really nice diver’s. Thanks, saw the titanium as well and been debating on which way to go. The titanium makes sense and a few good deals on that model just now bringing it down a good bit lower than the AD retail pice of the steel version. I will order this weekend once i check i have the best deal in place. Thanks.